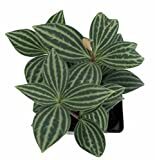 Peperomia growing subshrub succulent of the genus Peperomia also known as radiator plant, Peperomia perennial evergreen used as ornamental plant, can grow in subtropical, mediterranean to tropic climate also as houseplant and growing in hardiness zone 10+. Leaves color green, red, purple, pink or can be variegate with white or yellow, can be with prominent vein in elliptic, round or heart shape. 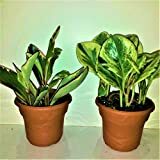 TWO Peperomia Plants In Four inch Panterra Pots with Saucers, Emeritus Gardens Booklet On Houseplant Care and Emeritus Gardens Plant Food.